New decking looks great…old decking…not so much. 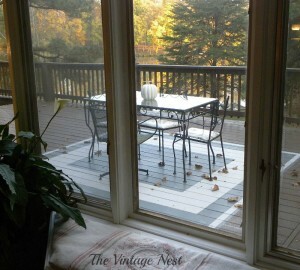 Even when you clean and maintain your decks on a regular basis it doesn’t take long for a deck to lose its luster. Sometimes the best solution to a problem is not the conventional answer, but a creative one. That can certainly be true in DIY home renovation and repair. A little imagination, coupled with experience can save money, time and frustration. Alisa Burke of www.alisaburke.blogspot.com is an exceptionally creative thinker and DIYer. She is also fortunate that she has a husband who is very supportive of her artistic sensibilities, and collaborates with her to come up with long term solutions to DIY problems that crop up when a project captures her creative imagination. Alisa and her family live in Oregon where rainfall, moss and other climate related factors had left them with a rear deck that definitely needed a makeover, but which still had some life left in it before replacement became mandatory. Furthermore, the family really needed to build up their DIY savings before that rebuild could be contemplated. Alisa and her husband estimated that the deck, as it was, had about two more winters left in its viable lifetime. Part of their DIY approach was to consider ways they could not only extend the functional life of the existing structure, but make it more inviting and attractive at the same time. Alisa got the idea to paint the deck. 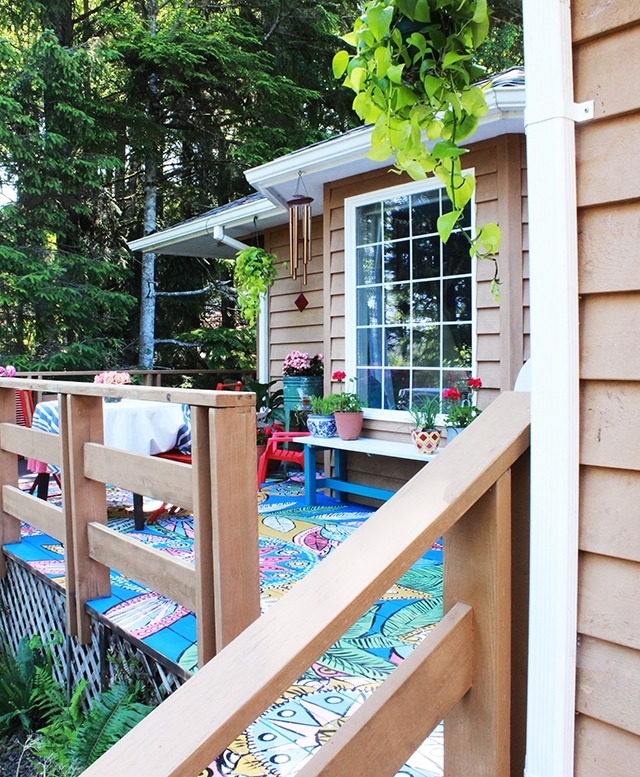 Now, I can hear you all out there going “so what?” But Alisa didn’t have just a boring monotone color scheme in mind; she wanted to paint the old deck in vivid colors and intricate patterns! Specifically she had it in mind to take inspiration from the colorful suzani tribal designs of Central Asia. Suzani is a type of embroidered and textured fabric originally created to be part of a bride’s dowry. The intricate needlework employs very basic stitches, but incorporates elaborate abstract representations of moon disks, flowers, vines, leaves, fruit and the occasional fish or bird. 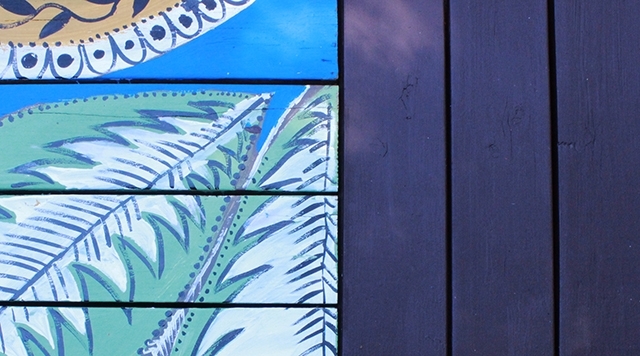 Some of you are wondering, why go to all the trouble of painting such an elaborate design when even with the best outdoor paints, the painting will weather and eventually peel? But for Alisa, that was part of the enjoyment of the potential project and what really fired up her spirit and imagination. She loves painting, adores bright and lively colors and extravagant patterns. Like many artists she gains a sense of peace and contentment when creating art. She embraced fully the inevitability of her creation degrading over time, looking forward to the transition between new and fresh to worn and aging. Paint does have several advantages over slapping a coat of stain over the deck and calling it good. Paint fills in cracks, blemishes and gaps with ease; it is resistant to mold and moss, sun damage as well as dry and wet rot. Utilizing special deck and exterior paints for the project would also help extend the life of the space until they could afford the cost of the future replacement. 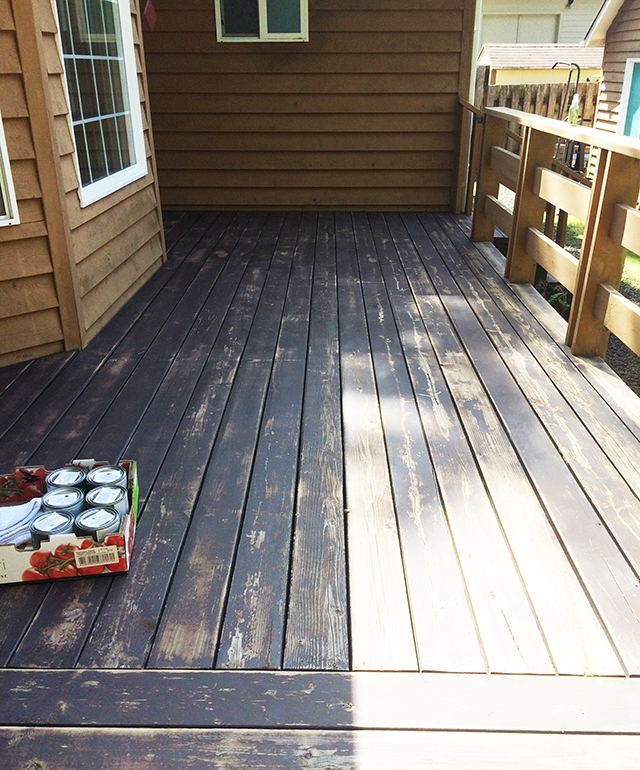 Alisa chose a vivid palette of colors and set to work after her husband cleaned the deck and removed moss and mildew. She didn’t plan out her design ahead of time; instead, she got right down to the job, letting the elements of her pattern and color scheme to fly off the top of her head. Alisa had an important revelation in the wake of finishing the project. 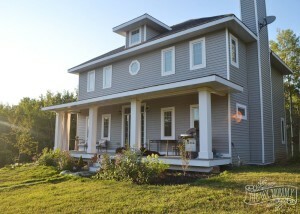 She, her husband and child had not used the deck much in its pre-paint stage, preferring instead to take outdoor activities beyond it into their large backyard. But with the completion of the colorful suzani paint job, the deck figures large in all aspects of their enjoyment of their property. The warm, bright colors make the space not only ideal for outdoor meals, but quiet reflective activities such as drawing, reading or making music.